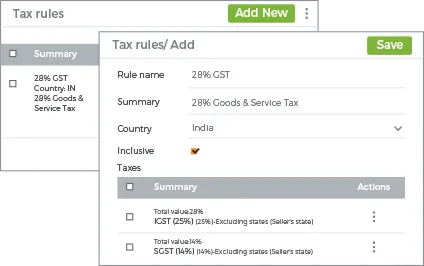 unique taxes easily with simplified tax rules. Automate your taxes with full support for GST, CGST, SGST and inter-state IGST. Get complete GST support for multi-vendor enabling you to apply different tax rules for a multi-product order based on the vendor and buyer locations. Multiple readymade and editable invoice templates for easy billing and invoicing. 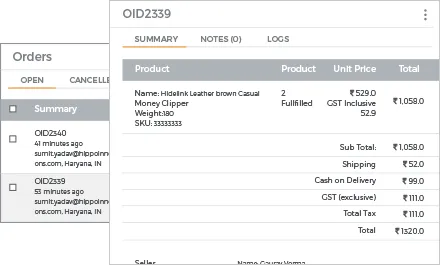 GST compliant invoice templates simplify the process of showing various components of GST in the invoice. 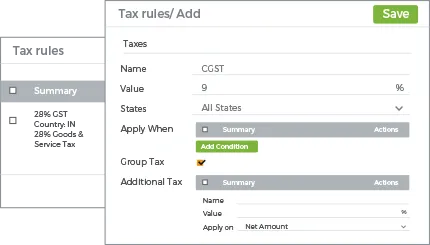 Simplify tax calculation by easily adding multiple taxes under one main tax rule. Club multiple taxes to make the final invoice look simpler to your customers. Set different tax-based rules to define when a particular tax will be applicable. 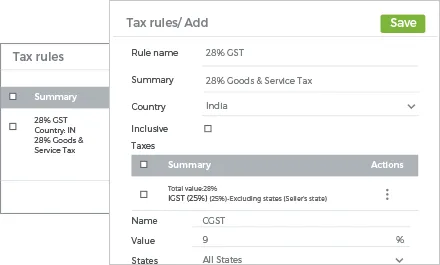 Set various tax-rules based on product, order amount, countries or any other criteria under consideration. Specify your product prices inclusive or exclusive of taxes. Use the inclusive rule to show the final product pricing inclusive of the tax amount. Keeping prices exclusive will show taxes exclusively in the final invoice. Integrate your store with the popular accounting software like QuickBooks. Get all your tax calculations automatically synced with your favourite accounting system for easy calculation and remittance. Why our customers love us ? StoreHippo experience is fantastic! Absolutely no issue, i have some bitter experiences with Zepo that is the reason I moved to StoreHippo and found clear-cut differences here. At StoreHippo you have huge infrastructure available. The developers are very active and they keep the committed timelines. However, I would appreciate if there is more call support than mail support. The admin panel is very user-friendly. All that one needs is there and true to the DIY concept, the help center is elaborate and helps you with any query about the features and functionalities. Am very very happy with the overall experience with StoreHippo. I thank my friend who recommended StoreHippo to me. The best part about StoreHippo apart from a highly flexible and feature-rich platform is the support they give.The support and technical team provided us elaborate demos. The listened to us and provided the solution /changes wherever we needed. We are happy with the final output of our store. This is one of the best part. I never saw this much of support in Zepo. Also I have discussion with my other friends who are into similar activities but from other platforms. My website is doing best because our each and every query and modification request has been answered. Urging SMBs to come online in assistance with StoreHippo only, the Most Flexible Ecommerce Platform.You will get user-friendly Dashboard, Admin panel, Ease of Operation and the utmost level of assistance and care from StoreHippo Team, which really help you to grow your online world with ease and perfection. We wanted a solution which is effective and where we can create an e-commerce marketplace with minimal technical expertise, StoreHippo was able to deliver on each and every promise made at the time of sales pitch which is usually not the case of most of the service providers out there in market. My note of thanks to StoreHippo. My website users are saying that it is very fast. Special thanks to the customer support team for providing the earliest possible resolution for any issues. I am positive StoreHippo will continue making headlines and prosper along with its clients growth. My experience with StoreHippo has been wonderful. I got full support from selecting a design to integration of payment providers. I highly recommend StoreHippo as a E-commerce platform for entrepreneurs who wish to achieve success in the online world. StoreHippo Team listened patiently and completely understood our smallest requirements. The Technical team made the changes which were needed for our store. We are very happy with the way our requirements were handled by the enthusiastic team of StoreHippo. © copyright 2017 StoreHippo.com . All Rights Reserved.